It’s never a dull moment in Vancouver. As if things weren’t crazy enough in Vancouver hearing about how the city council wanted the NHL to step in and do things that their police force are supposed to handle, the mayor is now getting in on the action. Vancouver mayor Gregor Robertson has had his hands full in trying to help get the city straightened out after the riots that erupted in the city following Vancouver’s Game 7 loss to Boston in the Stanley Cup finals. With the bills piling up to help pay for the clean up and repair of the city’s buildings, the cost is immense and he’d like to see the Vancouver Canucks help pick up part of the tab. Megan Stewart of The Province has the story about how Mayor Robertson would like to see Canucks ownership help chip in. “That’s definitely an open discussion and one that we need to have with the Canucks and the league [to] make sure that it’s equitable, that the costs related to big celebrations are borne by everyone who is benefiting,” said Robertson, speaking to reporters Tuesday after the Vancouver Police Board met to discuss the police department’s own internal review into the riot. Robertson sits as chairman of the police board. “It’s been a difficult conversation in the past and there hasn’t been willingness, but given what’s happened, I’m hopeful that there is some receptiveness with that going forward,” he said. Considering the city council already stepped in it knee-deep in calling out the NHL for not doing enough to help out with the riots as they happened, coming forth to ask for money from one of the NHL’s member organizations seems like an added slap in the face. The guys at Kurtenblog also think that the mayor and the city are trying to have their cake, eat it, and have someone else pay of it through all this. But seriously — shots fired at the NHL, then potential demands for the Canucks to foot cleanup costs? Isn’t this the same Vancouver City Council that anointed April 27 “Canucks Day“? With the flag raising and the framed proclamation and the obligatory Green Men cameo? 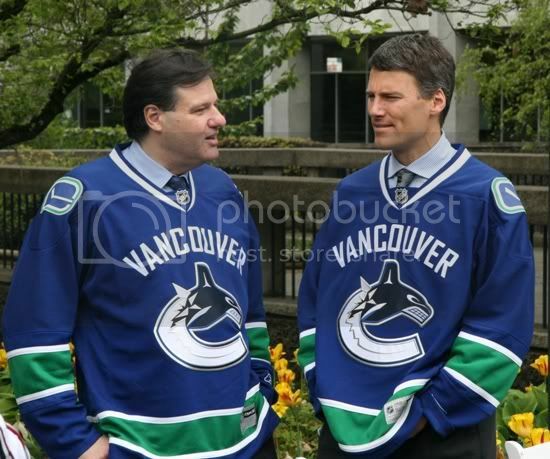 There’s even a photo of the mayor meeting with the Canucks owner while sporting a Canucks jersey. We understand that having to pay for your citizens acting like hooligans and ruining the city comes at a cost that a city shouldn’t have to ever deal with. Riots stink and riots that happen because of an unwelcome sports conclusion stink and are stupid. Having the city continue to try and pass the buck and the blame to the NHL and to the team that calls the city home, perhaps the city council and the mayor would be better off not having a team in Vancouver at all. They have to know they have a team there with a rabid fan base that has a history of lashing out in a destructive manner. While the expense of having all your police out in force hurts the wallet in the meantime, having to pay out for overtime is less costly than having to pay for overtime and to help rebuild and repair the city after morons tried to destroy it. The city doesn’t like having to pay for it, but a little more forethought and a lot more police should’ve been their priority when thousands decided to gather at the arena in hopes of a celebration.